Modification of Visitation FAQ: I need help on How to Modify a Family Law Visitation Order in the County of Orange, do I need an attorney? Visitation orders are often issued as part of a parenting plan in California, along with a child custody order. In certain custody situations, a visitation order allows one parent to spend time with a child even if that parent does not have custody of the child. Visitation orders have a lot in common with child custody orders. They are created and issued based on the child’s best interest, and they may need to be modified along with a custody order or on their own, as a child’s life changes, as the lives of the parents change, or sometimes, as often as every two and a half to three years to keep up with the constant changes of life. What is a Visitation Order in California? 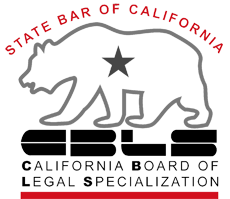 What are the basics of a Visitation Order in California, which are easy to understand? When a child custody order is issued, there are two different kinds of custody that must be covered, and there are two ways that each type of custody can be issued. Child custody refers to physical custody, or, the part of custody that determines where a child will live, and legal custody, or, which parent will have the legal right to make decisions for the child. Visitation deals with physical custody. In the custody order, it can be awarded either jointly to both parents, or solely to one parent. When joint physical custody is awarded to both parents, it means that both parents will spend time with the child under the custody order. However, when sole physical custody is awarded, it means that a child will live with one parent, and only with one parent. In order to spend time with the other parent, there will usually also need to be a visitation order in place. A visitation order allows the noncustodial parent, or the parent in a sole custody arrangement who does not have custody of the child, to legally enforce his or her right to spend time with the child. There are several reasons why a parent might be awarded visitation rights instead of joint custody, from practical reasons like a demanding job, to more serious reasons like accusations of child abuse. Several kinds of visitation orders can be issued in California, and each may be issued for a different reason, depending on the best interests of the child in question and the unique family situation. What Kinds of Visitation Orders Exist in California? 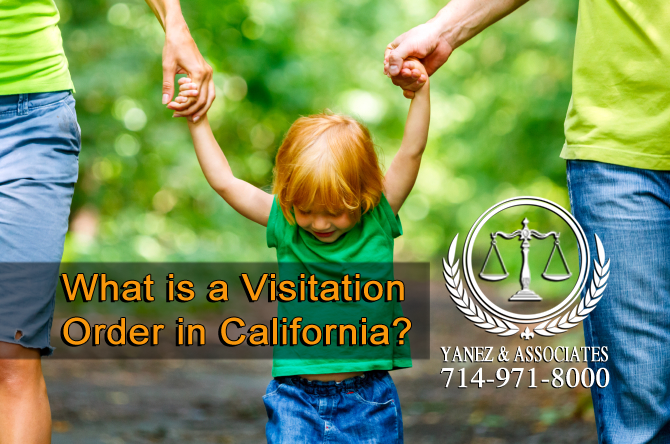 What Kinds of Visitation Orders Exist in California and which one will work best for me and my child? There are four main ways that visitation is issued in California: scheduled visitation, reasonable visitation, supervised visitation, and no visitation. Each of these types of visitation, with the exception of no visitation, may allow the child to spend any amount of time with the noncustodial parent - the amount of time will be specified by the court in the visitation order. Scheduled visitation is the most exact and specific kind of visitation order. The terms of a scheduled visitation order may include very specific details, like where exchanges will occur, the dates and times, who will be present for those exchanges etc. They may also factor in details like birthdays, holidays, family vacations, school breaks, family reunions, and other special days in the child’s life. It can be difficult to defend a violation of a scheduled visitation order, as it leaves little room for argument. Reasonable visitation schedules are a little bit more relaxed, and they can leave more of the details up to the parents. A reasonable visitation order may state, generally, how much time a child will spend with each parent, but it leaves the details up to the parents to work out between themselves. A reasonable visitation order works best when the parents are on good terms and have good communication skills. Supervised visitation allows the child to spend time with the noncustodial parent only under the supervision of another qualified adult. The adult supervisor is usually specified in the visitation order, and may be the custodial parent or another person, depending on the child’s unique situation. There are many reasons why supervised visitation may be ordered. Supervised visitation protects a child from a parent who may have a history of violence, abuse, neglect, or generally not looking out for the child’s best interest. Supervised visitation gives a parent and child who have no existing relationship, for any reason, a chance to form a relationship. Supervised visitation can be used as a stepping-stone for a parent who wishes to have unsupervised visitation or custody of his or her child. Sometimes, no visitation may be awarded to the noncustodial parent. This usually happens when it is not in the child’s best interest to spend time with the noncustodial parent, or, when that parent is unable to spend time with the child. Generally, it is always best for a child to have a relationship with both parents. A parent who does not wish to spend time with a child may also be awarded no visitation rights. 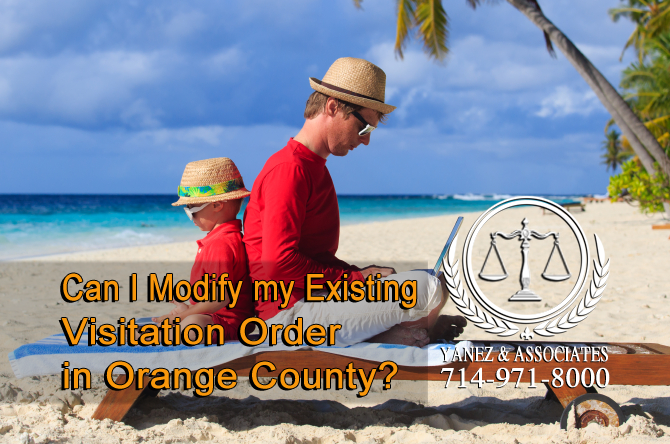 Can I Modify my Existing Visitation Order in Orange County? Are modifications of Existing Visitation Orders in Orange County Allowed? Modifying a visitation order may be allowed either with the modification of a child custody order or separately. When a visitation order is modified separately from a child custody order, it may be for one of several reasons. A visitation order may change from supervised to unsupervised visitation, or from unsupervised to supervised visitation based on the behavior of the parent. As parents’ relationship with one another changes, for example, if they are getting along better, they may request a reasonable visitation order instead of a scheduled visitation order. Those that are having issues agreeing on the terms of a reasonable visitation order may opt to change to a scheduled visitation order. Generally, visitation orders are modified for the same reasons that child custody orders are modified. This means that there needs to be a significant change in circumstances that renders the existing visitation order no longer in the child’s best interests. There are numerous factors that can come into play when creating and modifying a custody and/or visitation order. Depending on the type of visitation order, it may or may not need to be legally modified for things like a change in work schedules or one parent moving a little closer or farther away from the other parent. Reasonable visitation orders, and sometimes even scheduled visitation orders can still function correctly with these changes. More drastic changes, like if one parent is incarcerated or hospitalized, showing signs of mental illness or unable to care for the child, or if the parent wishes to change, and has reason to change, between supervised and unsupervised visitation, or no visitation and visitation, may require a legal change. I am ready to Modify my Visitation Order in Anaheim, CA, where do I start? If you are ready to modify your existing visitation order in California, always speak with an attorney first. Your attorney can help you determine, before you file anything with the courts, whether or not you can show that there has been a significant change in circumstances that shows that the existing visitation order is not in the child’s best interests, and that a new visitation order would be in the child’s best interest. To get started, you and your attorney will need to fill out the correct forms for your local court. Usually, you’ll need a form called a Request for Order, and another one called an Information Sheet for Request for Order. These forms will give you the opportunity to state why you think the visitation order needs to be changed, and present a potential new visitation order. Make sure that your lawyer looks over your forms for accuracy before you file them with the court. The clerk should then give you either a mediation date, a court date, or both. Once you have these dates, you will need to serve the papers on the child’s other parent and file a proof of service with the court. This shows the court that the other parent is aware of the action being taken against him or her. Make sure that you attend mediation and/or your hearing, no matter what. Failure to appear can lead the judge to dismiss your case. If you come up with an agreement in mediation, you can present it to the judge for him or her to sign into a court order. Or, if you do not come up with an agreement in mediation, the judge can make a decision regarding your visitation order at your hearing. You may or may not be responsible for preparing the court order for the judge to sign, depending on the county in which you file. Ask your attorney if you aren’t sure. Modifying a visitation order can be complex, depending on your unique family situation and the best interests of your child. An attorney can help you understand how the law applies to your case, when and how to file, and how to complete your modification. Contact the lawyers at Yanez & Associates today to schedule a free initial consultation with a qualified attorney. 2 What is a Visitation Order in California? 3 What Kinds of Visitation Orders Exist in California? 4 Can I Modify my Existing Visitation Order in Orange County? 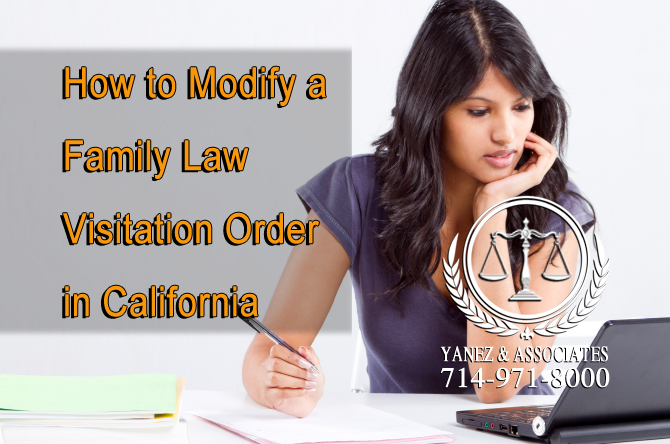 Can I Modify my Existing Visitation Order in Orange County?, child visitation, How Do I Modify Child Custody in Orange County?, How to Modify a Family Law Visitation Order in California, Modification of Judgments and Orders in Orange County, Modification of Orange County Child Custody & Visitation Orders, Modifying Visitation Orders in California, Orange County Modification of Visitation Orders Attorney, visitation, What is a Visitation Order in California?, What Kinds of Visitation Orders Exist in California?